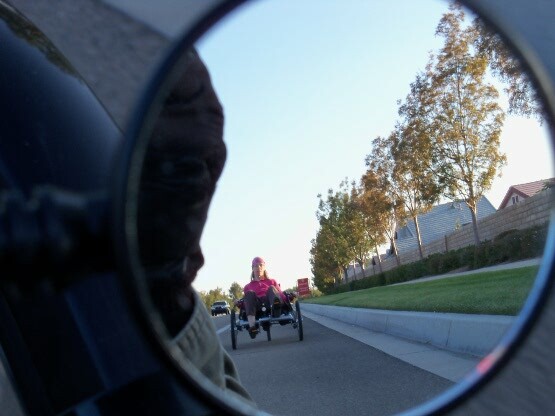 A family that trikes together has a blast together! How do I know this? 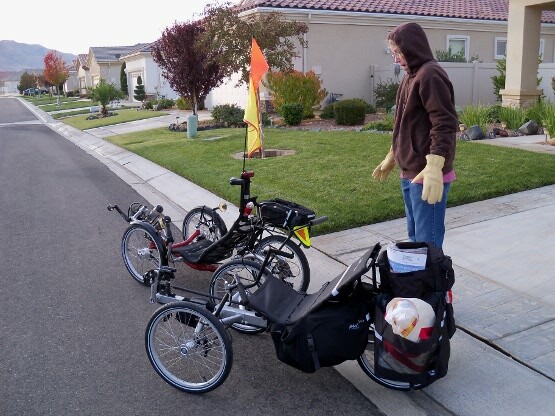 Well, after riding my ICE Qnt to southern California from Oregon, in order to, among other things, visit my mom and sister, one of these two family members decided she wanted a trike. Willow, my sister, operates a modest critter sitter business in these parts, necessitating her remaining in clients’ homes for extended periods of time. 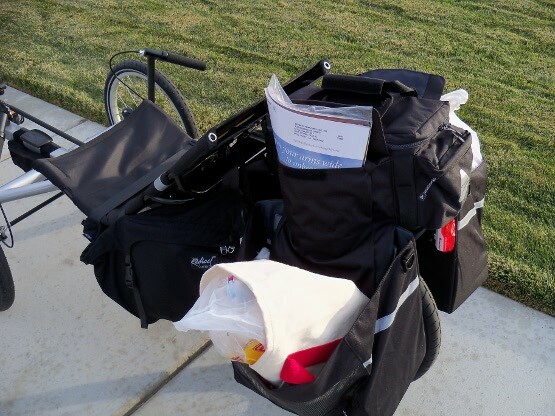 Walking her supplies is usually out of the question if the client lives a distance away, so dear old mom has been providing a shuttle service up to this point in her petroleum powered automobile. 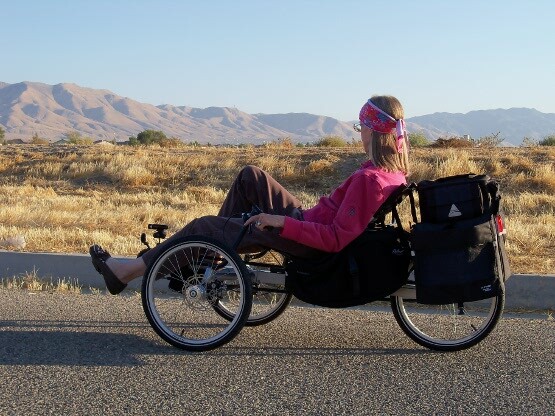 Being a fit human who owns no car and walks everywhere, Willow realized that a tadpole tricycle would provide an ideal human propelled method to conduct her business. 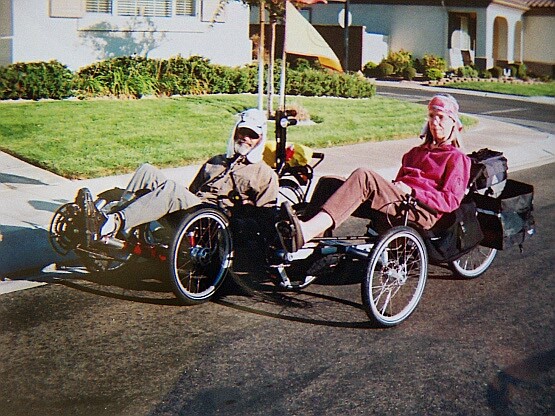 After consultation with yours truly, she finally decided to order a TerraTrike Rover through Hostel Shoppe Recumbents. This decision was largely based on the fact that I have experienced flawless customer service from Hostel Shoppe over the years, and she wanted peace of mind, realizing she could return something with no hassles if necessary. 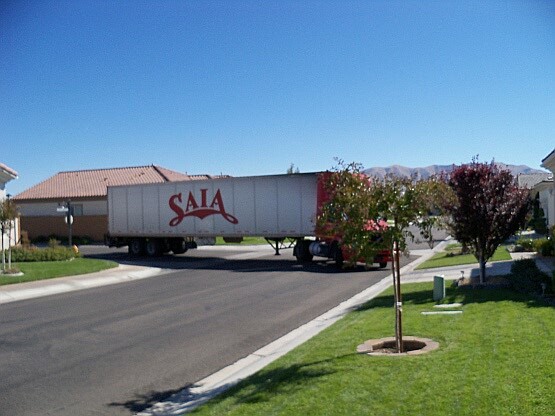 The Saia truck rounds the tight turn towards Willow and mom’s house. There’s a TerraTrike Rover in that truck! Jessie said it would be a very large box. At about 50 pounds, this box was pretty easy to get into the garage. Upon opening the box for inspection, here is what we observed. Right from the box, the Rover looks like this. Willow finally sits on her brand new Rover! 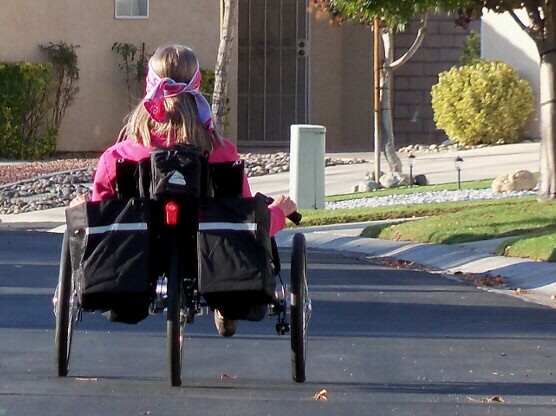 It’s time to cautiously cruise the neighborhood and get the feel of this new set of wheels. 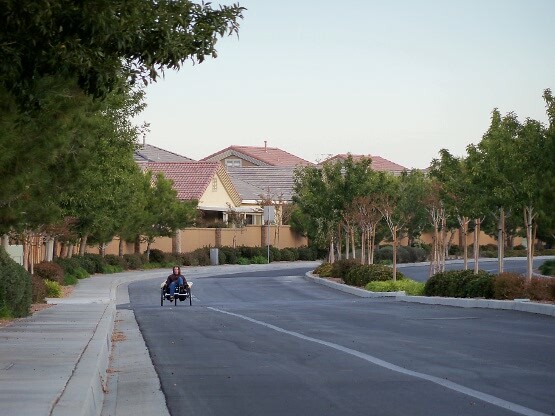 There is plenty of riding space in this gated community, often used by golf carts. Ahh, the peaceful serenity of a late afternoon ride on a well built steed feels great. The wide open spaces will now be covered quicker than on foot. 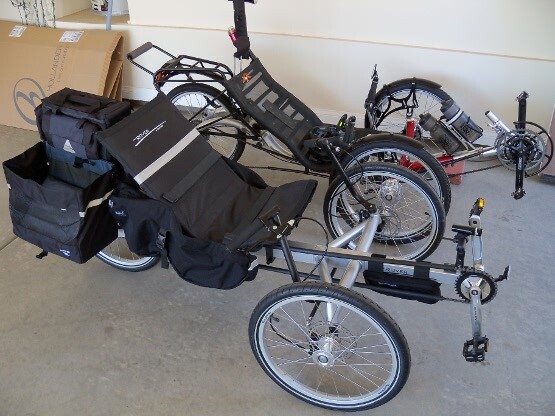 Notice the Radical Design side seat panniers, 20 liters of storage on each side of the recumbent seat. I gave my set to Willow for her extra cargo needs, so I’ll be getting a new set for the Q. 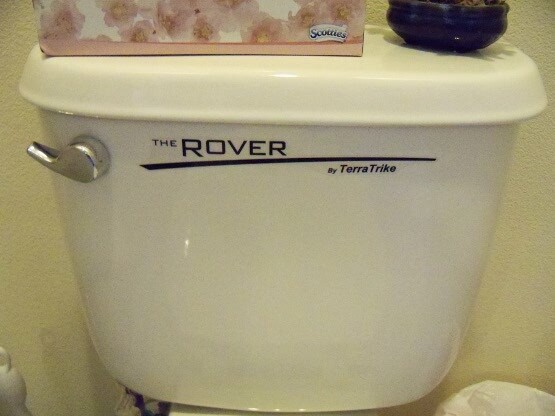 Here is a happy Rover owner, totally stoked with the comfortable ride. 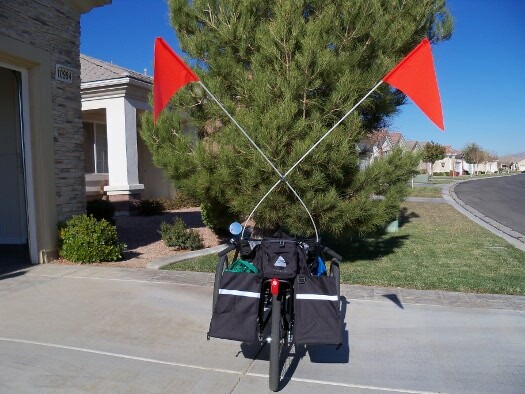 Those are the “grocery bag” panniers on the rear rack. Trike On, Sis! The top trunk is made by Axiom. From my mirror on the Q, here is the way I saw it. 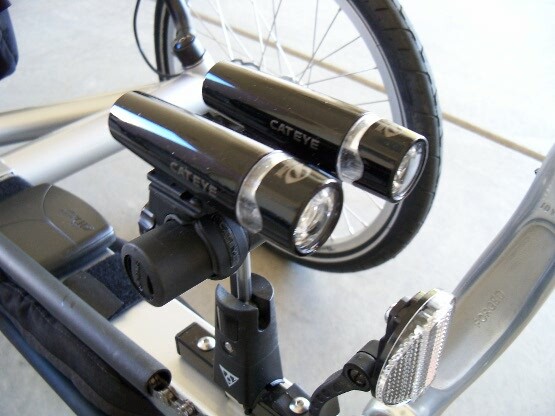 Two Cateye lights are better than one, with both steady or flashing mode – sure looks cool at night! 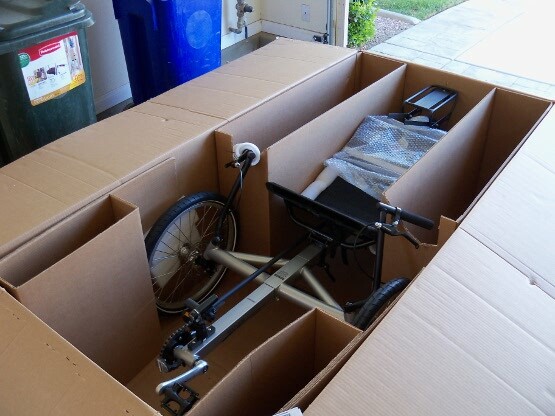 What a beautiful cardboard sculpture, the remnants of the Hostel Shoppe trike shipping box! The cold morning of November 10 found Willow leaving for her next critter sitter assignment, the first time on her new TerraTrike Rover! I rode with her on the maiden voyage to make sure all worked as expected. The sun’s rays were not warm enough yet to have any appreciable effect on the two of us. 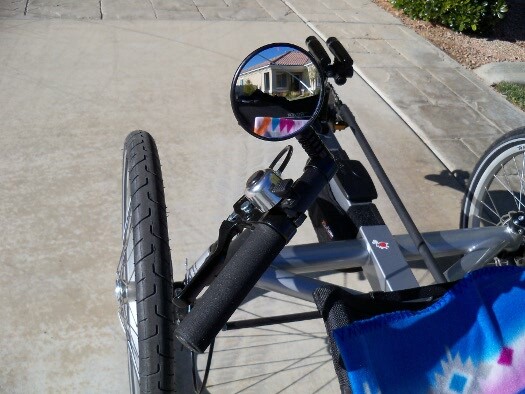 Cranking up to speed … well, as much as possible with a one-speed trike anyway! 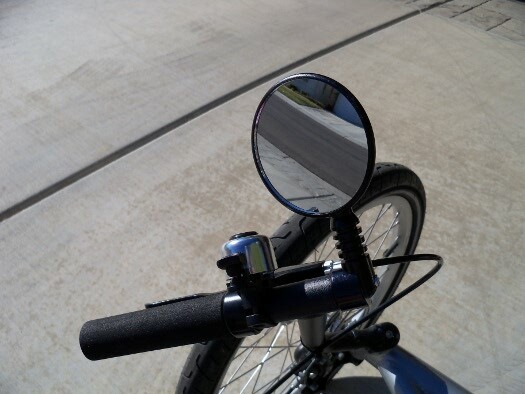 You can see the streets are flat, making multiple gears unnecessary, unless you want to go really super fast, as I do occasionally when riding around in here. 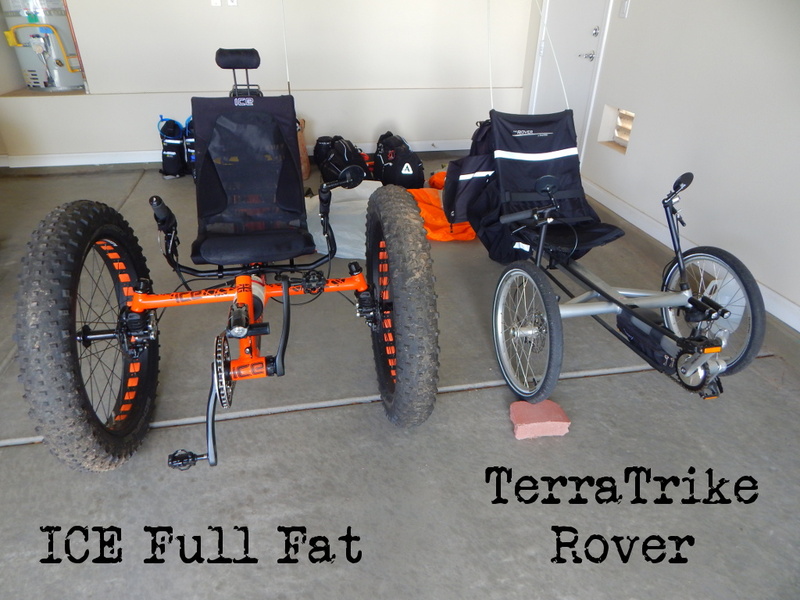 Gettin’ closer – the Rover is running just fine. She LOVES this trike!!! 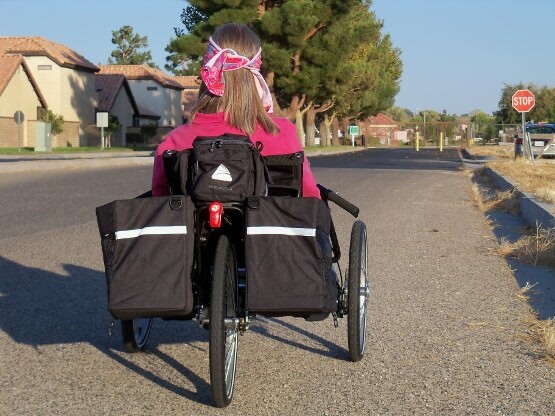 Willow’s pannier system is filled to the gills … almost, as she arrives at her client’s home. She positions her Rover near the front door to unload her supplies for the six day assignment. 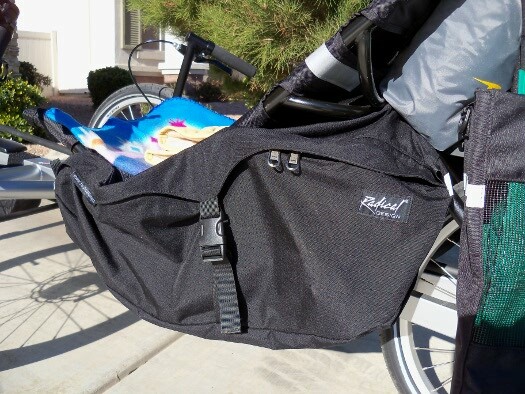 Radical Design’s side seat pods, at 20 liters per side, provide additional cargo capacity. 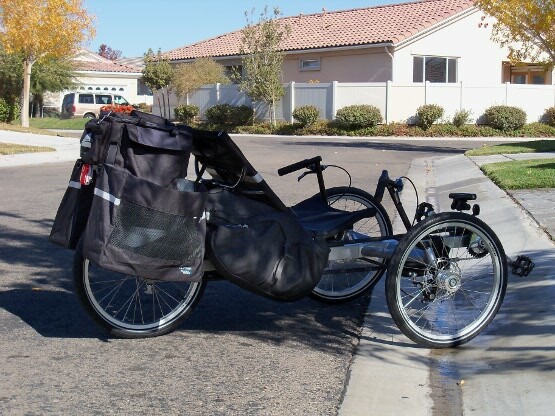 These are the panniers I used on my trek from Oregon – still look like new! 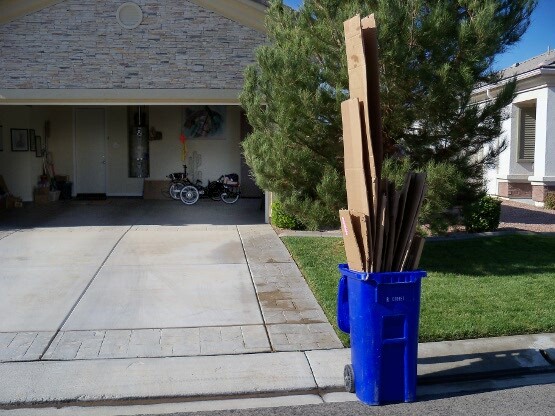 If you noticed how the Axiom grocery bags sagged significantly when loaded (in the photographs earlier on this page), you’ll see how Willow and I solved the unwanted problem that came from the factory. I installed a grommet on each bag, and then ran a bungee cord across the top to the opposite bag. Now, instead of the bags flopping open due to lack of internal framework, they remain upright to better hold the load. These Axiom Hunter bags are made of quality material, but could use some functional shape reinforcement to keep groceries upright. 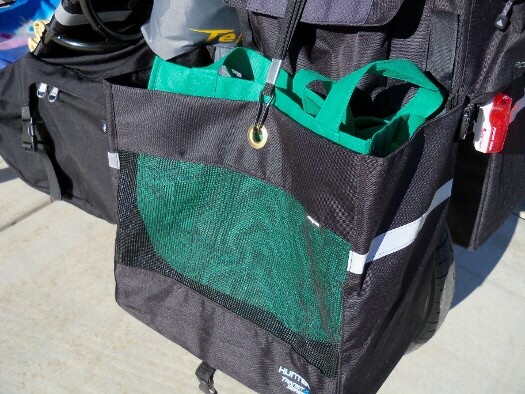 They come with a plastic insert for each bag, but those do not keep the load upright. 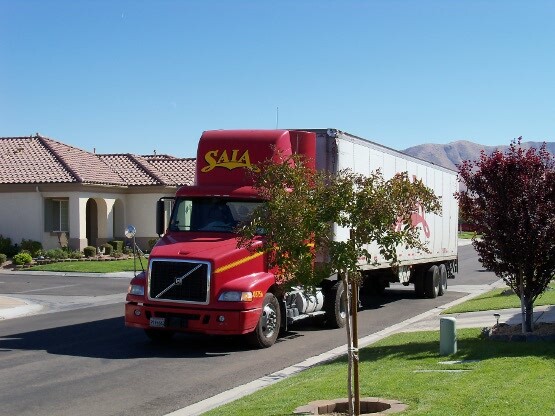 We also installed dual flagpoles, and then crossed them for added visibility. Now Willow shows up from a long distance off. Willow’s call of adventure has taken over! She now rides DIRT! 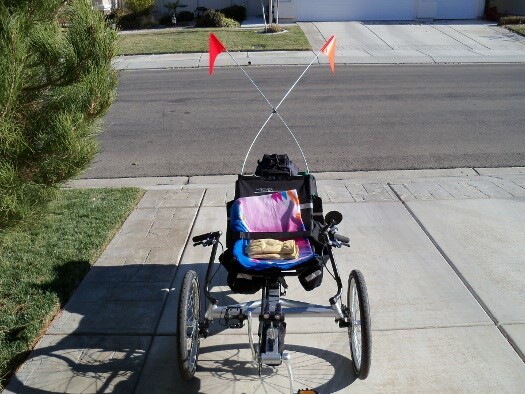 Okay, before the folks over at TerraTrike get too bent out of shape about what this photo might infer, let me say that Willow has a grand sense of humor, and with so many decals that come with the Rover, she wanted to maximize her time on the trike! 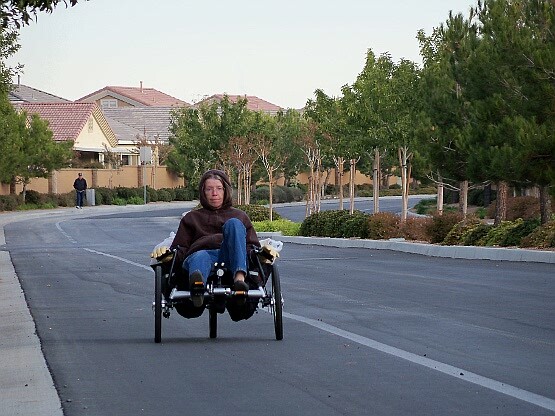 Willow thinks her Rover is far and again cooler than my ICE Qnt, so she is most definitely hooked on these three wheels, and recommends them to the people she meets while pedaling here in the neighborhoods. 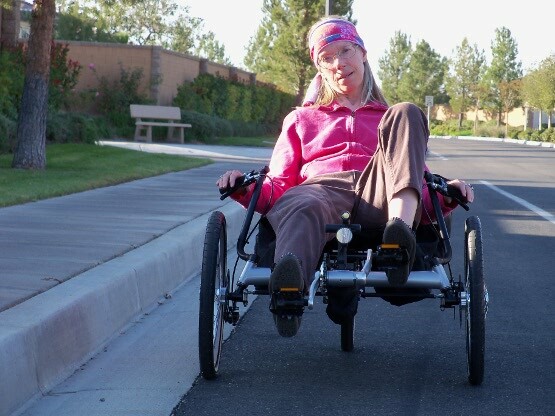 In fact, she carries business cards and TerraTrike brochures in the trike’s trunk to pass out to anyone who thinks they want one. So, to TerraTrike I say: You have one LOYAL customer who is now out spreading the word! UPDATE – APRIL 11, 2015: I just spoke to Willow on the telephone. Seems her seat clamp has worked its way loose since I originally tightened it back when she got this trike the final week of October 2011. After removing it from the Hostel Shoppe box, I adjusted everything in 2011, and made sure the quick-release clamp that holds the front area of the seat to the frame was extra tight, because I live nearly 1000 miles distant, and can’t just pop on by to re-tighten it in the future. Well, the engineering is such on this Rover that after about three and a half years, the clamping mechanism loosened sufficiently that the seat slid forward over the course of the past couple months, to the extreme forward-most place on the frame. 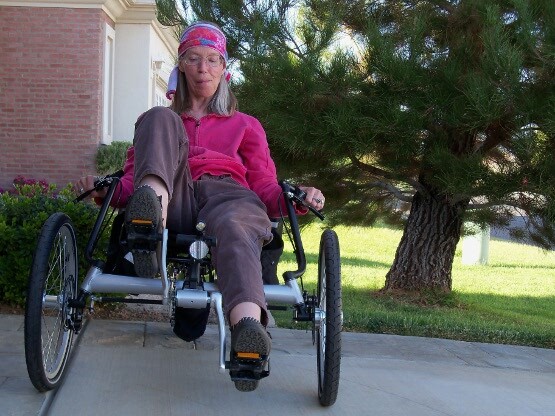 Willow has been riding it in such a reclined position that she can hardly pedal. 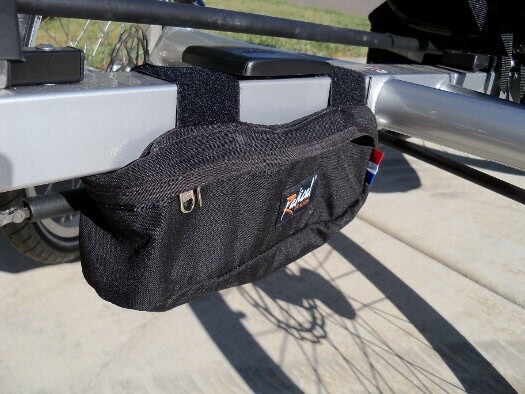 Not only that, but TerraTrike designed the rear pannier rack so that it attaches to the seat struts, which means that if the seat is at a severe incline, the rear rack is also severely inclined down in front. The rack and top trunk are pushing deeply into Willow’s back and neck, making riding very miserable. Also, the front angle of the seat is up so high that it cuts into the backs of her legs. Look at the photo above where the Rover was just removed from the Hostel Shoppe box to get an idea of where the seat currently is positioned. Riding like this is clearly not even comfortable. 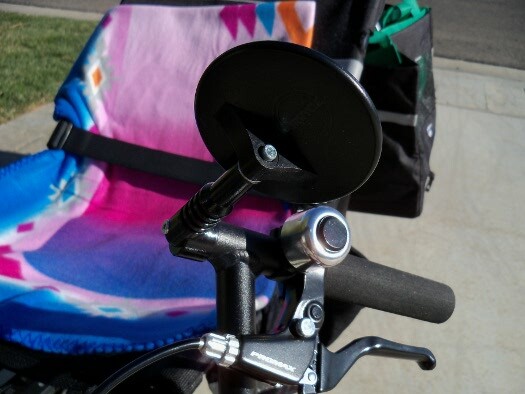 I have suggested that she see if Will Baird, also a Sun City Triker, can re-adjust the clamp and seat, which is an easy 60 second job for someone who understands the procedure. 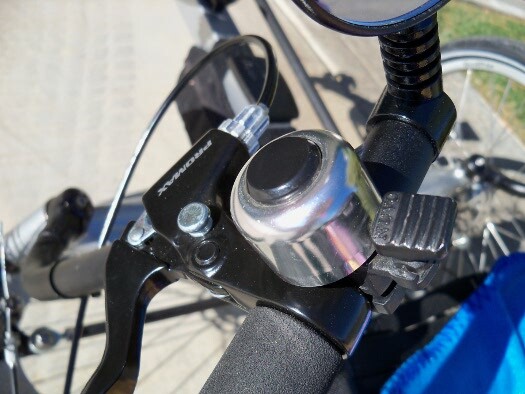 Also, Willow’s hand strength is not such that she would be able to tighten the quick-release lever enough for the adjustment to hold for any length of time – it would come loose again, only much sooner. 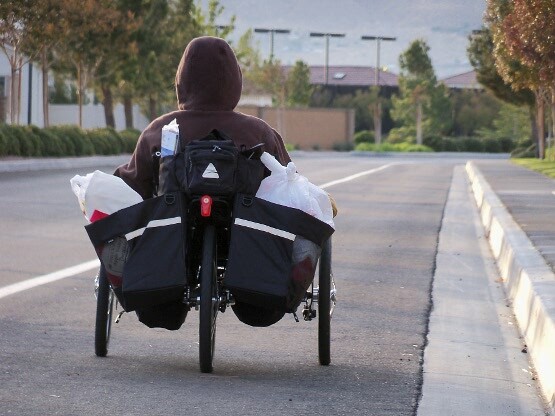 Recommendations to TerraTrike (if this has not yet been addressed): 1) Do not have the rear pannier rack angle or position be dependent upon the seat’s angle – make it independent, so that no matter what happens to the seat, the rack still works as expected and needed. 2) Re-engineer the seat clamping mechanism so that it cannot slide forward after a couple of years of use. Many folks who lack technical know-how, or are physically challenged in some manner, are not able to remedy this problem. What is easy for many of us, is really next to impossible for some people. 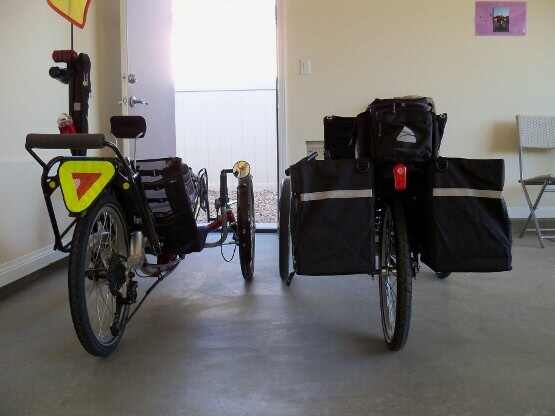 There is no bike shop near Willow, in addition to the fact that there is no way to transport the trike anywhere. 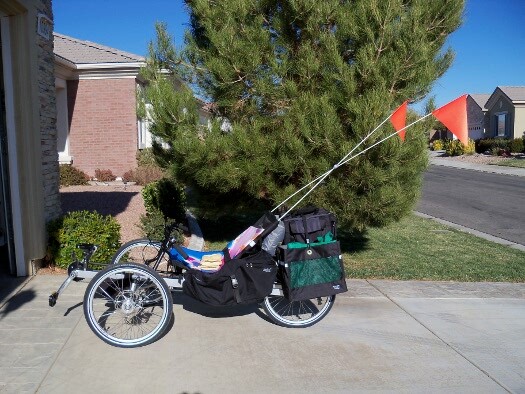 Folks who live in a similar situation, who have little to no mechanical know-how, and lack hand/wrist strength can find themselves with a trike that is no longer rideable, and it is only after being advised about the wayward seat and rear rack that I was able to shed some light on how Willow can remedy this today. 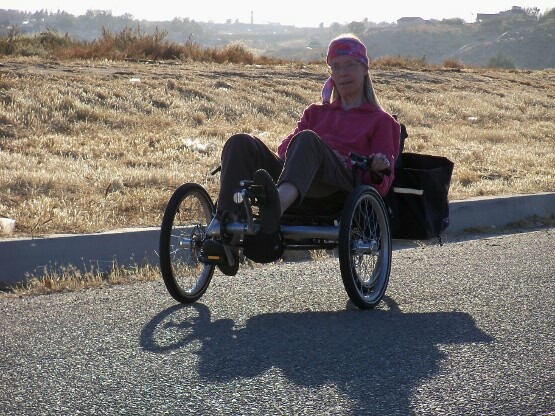 OCTOBER 2015 UPDATE: Having just visited my sister, I have remedied the issues so that she can once again comfortably and properly ride this tricycle. This second time I have tightened the cam-lock mechanism with a hammer, and can only hope that it will hold longer than the first time I did it only with my human strength. 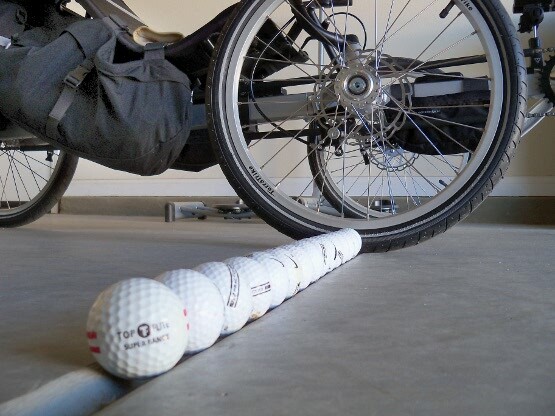 I have also installed Schwalbe Marathon PLUS tires all around, along with Kenda thorn-resistant Q tubes. The big news is that I also installed a SRAM three-speed rear internal drive hub, which now replaces Willow’s original one-speed design. This SRAM IGH shifts automatically, based on speed and RPM, with no conscious interaction from the rider! Willow loves the new speed with which she can cover ground during her rides. 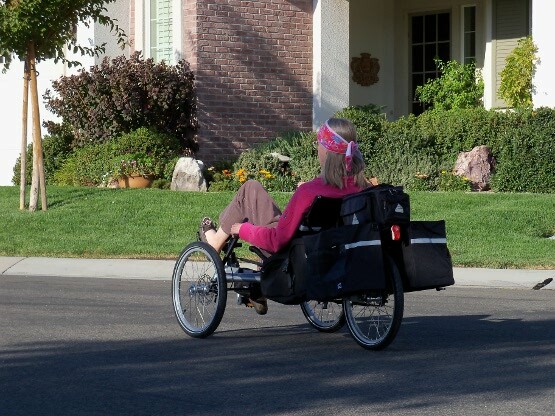 The hub also provides a lower low, so she can climb steep driveways with ease compared to before. Willow left a comment below. If you have a question of a non-technical nature, feel free to leave it here, and then when she accesses her computer again (randomly, so be patient), she can leave another reply for you. 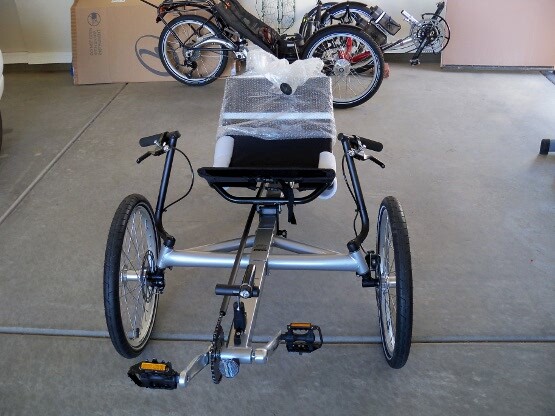 Any questions of a technical nature regarding the trike should be addressed to TerraTrike, or perhaps me if I can answer it. If you are considering an order through Hostel Shoppe, ask for Jessie Bostic, who can get you all lined out for a Rover of your own. By the way, this is the single speed version, because all the roads she rides are flat as a pancake. UPDATE 2015: It is my understanding that TerraTrikes are no longer available for mail order through Hostel Shoppe.